Southern Flames is excited to announce Mastering Dichro and Metals with Lisa St. Martin! Two 2-day classes will be offered: Thursday-Friday, April 24 & 25, 2008 and Saturday-Sunday, April 26 & 27 (filled). Members' responses to the recent poll strongly indicated a preference for this class, so both class sessions will cover the same material. The cost of the class will be $260.00. We are very pleased to be able to once again offer such a great value to the membership. 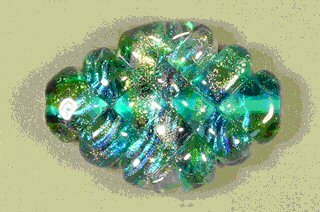 CLASS DESCRIPTION: This two-day class will concentrate on the use of dichroic glass and fine-pure metals in lampworked beads. 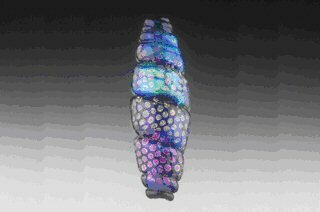 On the first day, students will dive into the mysteries of dichroic glass: what it is, how to purchase it, and how to successfully use it in the torch. 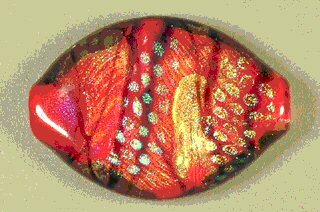 They will then work with dichro on clear, colored, and textured glass, and learn how to create depth by layering colors and patterns. The second day will be devoted to metals, such as copper, silver, and gold. Students will work with leaf, wire, sheet, and mesh, adding inclusions, granulations, and more. Techniques of gold and silver fuming will be discussed and demonstrated with emphasis on safety. (Disposable respirators rated for metal fumes will be provided.) Students will also make several "must have" tools in class. EXPERIENCE LEVEL: Advanced beginner and beyond. TOOLS AND SUPPLIES: Students will supply their own glass (Morretti/Effetre) including dichroic glass, and standard tools to be used in the class. Some metal leaf, mesh and wire will be provided. A materials/supply list will be sent to students after the lottery. The lottery for class placement will be held at the Southern Flames meeting at 7:00 p.m. on Saturday Feb 23, 2008. Prior to the lottery, each interested member must complete a Lisa St Martin Lottery Form and provide a check for $260.00 made out to Southern Flames. You may complete the Lottery Form and bring it, along with your check, to the Feb 23rd Meeting (additional lottery forms will be available at the meeting). If you would like to be included in the lottery, but will not be able to attend the Feb 23 meeting, you may mail your completed Lottery Form along with a check payable to Southern Flames in the amount of $260.00, to Southern Flames, c/o Kim Runge, 311 Peachtree Hills Avenue, Box 11A, Atlanta, GA 30305. Your check must be received by Kim no later than Friday Feb 22, 2008.Kim will email you a confirmation when she has received your check and form, and you will be entered into the lottery drawing. If you do not receive a confirmation from Kim within a reasonable time, please double check with her prior to the lottery as to whether or not she received your check and form.